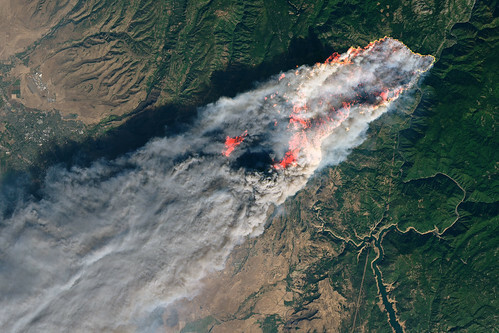 On the morning of November 8, 2018, the Camp Fire erupted 90 miles (140 kilometers) north of Sacramento, California. By evening, the fast-moving fire had charred around 18,000 acres and remained zero percent contained, according to news reports. The Operational Land Imager on Landsat 8 acquired this image on November 8, 2018, around 10:45 a.m. local time (06:45 Universal Time). The natural-color image was created using bands 4-3-2, along with shortwave infrared light to highlight the active fire. Officials are evacuating several towns, including Paradise. They have also closed several major highways.